"Lourdes Academy and Catholic Church"
Located on North Pine Street between Seventh and Eighth Avenues were the Lourdes Academy and the St. Andrews Catholic Church. The church was built in 1884 and moved to this location in 1904. The academy was completed in the fall of 1908. It was used as a school for Catholic children but also housed a convent and provided living quarters for students. The building was discontinued as a school in 1966 when the property was sold. Lourdes Academy on right and St. Andrews Catholic Church on left facing N. Pine Street.Postcard titled: "Lourdes Academy and Catholic Church, Ellensburg, Wash." Postmarked August 27, 1919 at Ellensburg and addressed to Miss Margaret Morrison, #967 E. 16th N., Portland, Ore. from Ruby Maddux. Handwritten note in ink. 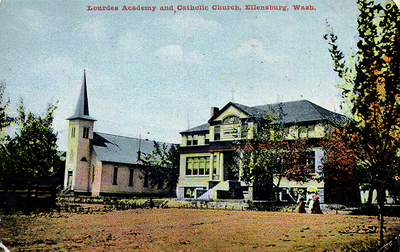 "Lourdes Academy and Catholic Church" (1908). Ellensburg History Photographs. 37.